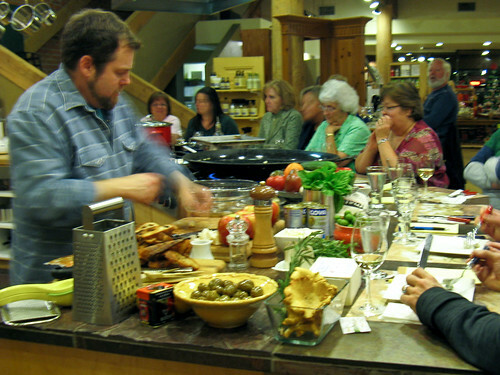 Last week we went down to Gretchen’s to help with Knut Christiansen’s latest cooking class. Once again the theme was tapas and paella, but he mixed it up with some different dishes and approaches this time. Sadly for me, a lot of this meant almonds, but I was hardly in danger of starving. 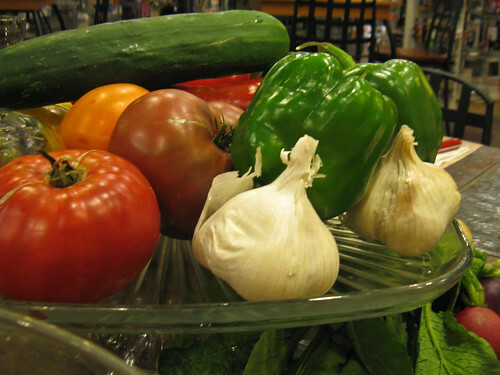 As usual, Knut did his shopping on the way down to the class and arranged his ingredients as beautifully as possible. 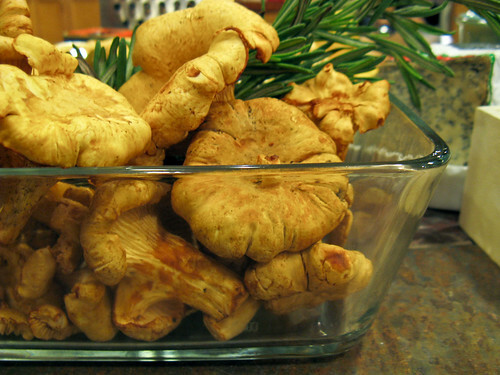 It almost seems a shame to chop the things up to cook them. 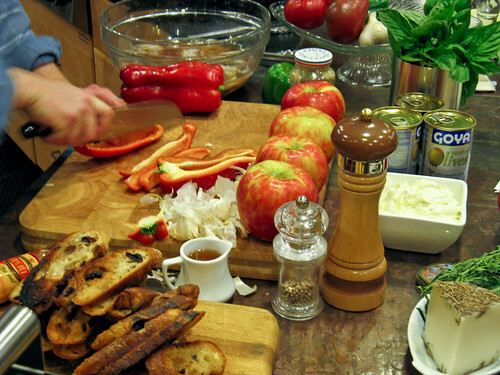 He began putting together tapas while starting the paella, which takes time to build. 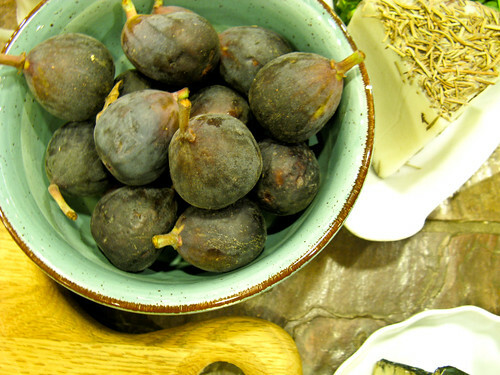 The first tapa was a fresh fig stuffed with lemon-scented almonds and incredible Cabrales cheese, broiled just long enough to make the cheese bubble and soften the fig slightly. I had one minus the almonds, and it was very good, even coming from a non-fig fan like me. 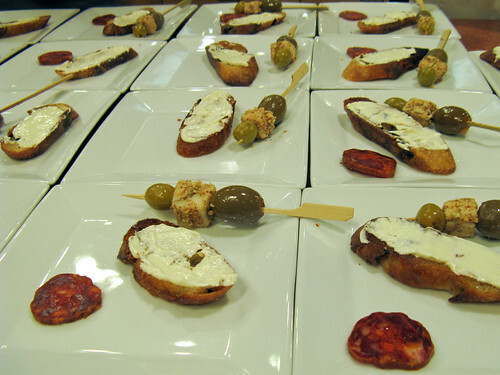 Tapa number two was a skewer of olives and almond-encrusted cheese, served with a slice of hard chorizo and a piece of grilled olive baguette slathered with goat cheese butter. The butter is one of Knut’s specialties, and this batch was made by whipping butter with Drunken Goat cheese for an incredibly long time until it became rich and silken. Dangerously good. 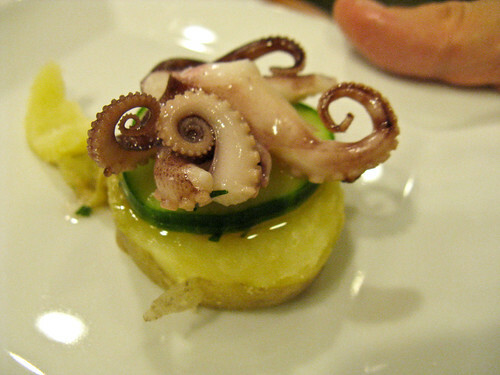 Then we built a little salad of boiled potato rounds, boiled egg rounds, cucumber slices, vinaigrette, aioli, and a small octopus. A little tricky to eat, but great flavors. And the octopi were, frankly, adorable. At last, the paella. Usually Knut’s paellas are focused on Northwest specialties and are not particularly traditional, but he was practicing for a competition in Austin the following day (which he ended up winning!) and took a slightly different approach than usual. 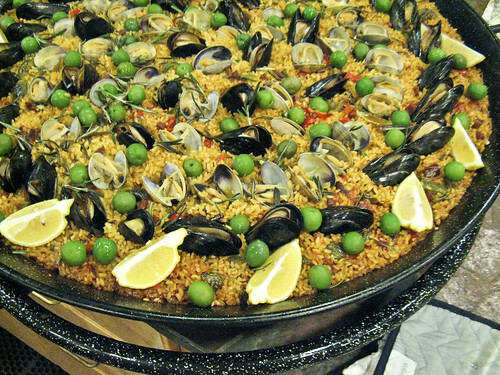 This paella featured the usual peppers, olives, mussels, clams and lemon, but he used hard chorizo instead of loose, and made roulades of fresh rockfish wrapped around a piquillo-chanterelle filling. 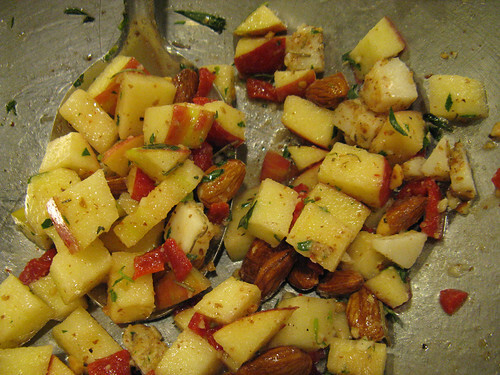 Finally, while the guests were working through enormous portions of paella, Knut threw together a simple apple salad with almonds and tarragon. Raw apples and almonds are a double mouth-hive whammy for me, so I didn’t try it, but it seemed to go over well. It was a late night, but very fine food. And we took some of the extra octopus heads home to the cats. Are we good cat owners, or what?